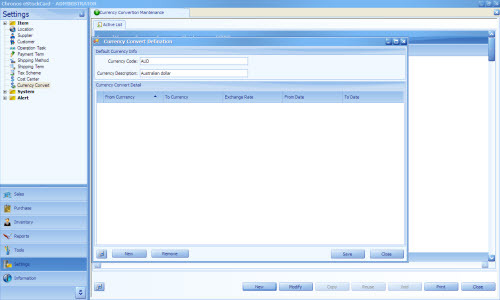 The Currency Convert setting screen is for the user to set the conversion rate for between 2 currency. For example if the system currency is in USD and when you defined a different currency for either the customer or supplier then you would need to set the currency rate between your system currency and the supplier/customer currency. 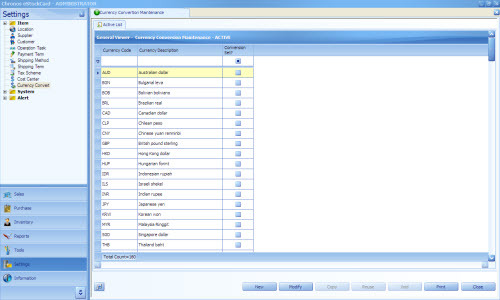 Step 5 Under the “To Currency” column, select the currency which the user would like to set the rate for. Step 7 Once done, Save it. Step 8 Notice that on the main screen of the Currency Convert if the rate has been set for the respective currency, under the “Conversion Set?” column, it will be ticked. Step 9 For adding of the a new currency rate for the Currency which has been set, just highlight it and then click Modify.